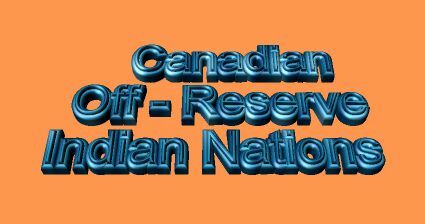 Canadian Off-Reserve Indian Nations, Inc.
Just a quick not to lend our support to your cause ! ( although, it might only be moral instead of financial at this point ! ) since we have four similar cases going to court ourselves. On November the first, one of our members, Jackie Voutour will be going to triall for illegal fishing ( clams ) on tidal waters . Four members of his family have been charged and each case will cost us $1500 a day for the lawyer, plus court charges, then on the 15th of November, another of our members will go to court on logging issues, and there are two others to follow, not taking into consideration the fact that hunting season is underway and we tld the members to do whatever the felt was right. Of course these are all members of my other organization, The Nation Of Acadian Metis Indians, which has 6800 members and is now a brranch of this new federal corporation for all off-reserve Indians and Metis in Canada.